I woke up the next day thinking I can’t wait to go and explore Havana. You know, that feeling of fear and excitement in the same time of a new place, when you are wondering if you will love it or hate it. First, I had breakfast in the small kitchen, and then took my coffee up on the roof terrace. It was just me there and the skyline of Havana looked impressive. I could clearly see the cupola of the Capitolio on one side and the lighthouse from the harbors’ entrance on the other. Between them – a lot of uneven buildings, all colored different, with white laundry drying in the sun, on the roofs. It was very warm but I could see stormy clouds approaching fast. “Why is it raining?”, I thought to myself. 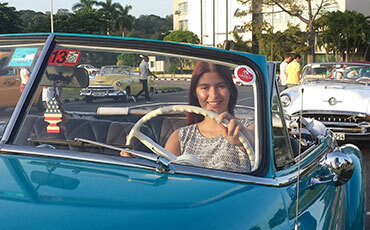 I knew that weather in December can be unpredictable in Cuba but could I be so unlucky? Later I found out that it was just the cold front coming from America, that colliding with the heat would cause storms for a few days. It wasn’t that bad though. 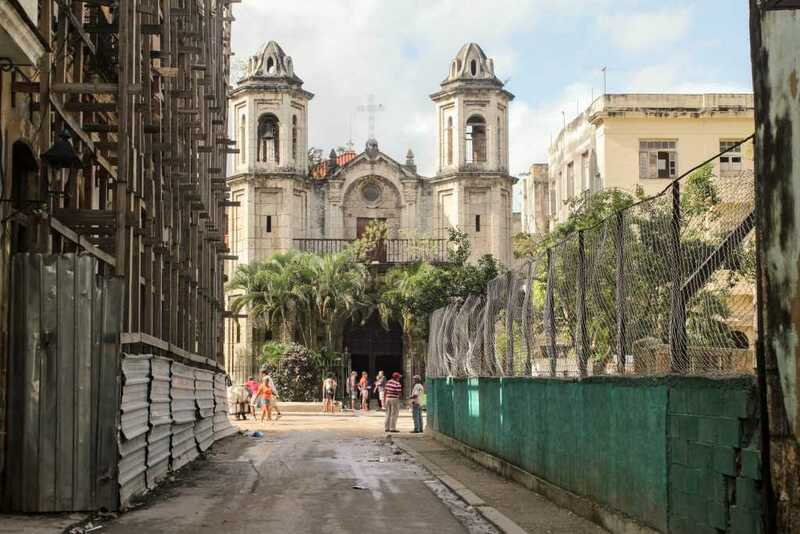 I started exploring Havana by heading towards the heart of the Old Habana, cut straight by Obispo boulevard, hard to miss because of the crowds. I infiltrated in a tour group and got inside the Johnson & Johnson Pharmacy, a still functional drugstore that looked like it was taken out of an old movie. 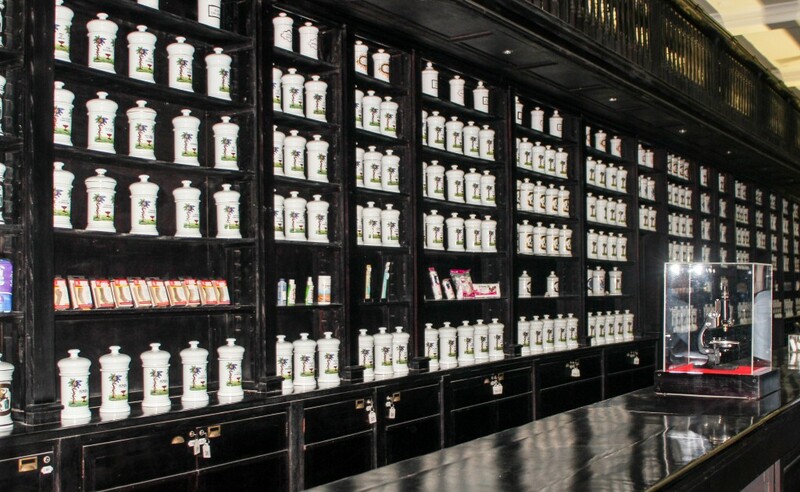 Big white jars were standing on black shelves, each of them decorated with a different pattern. In the middle of the counter, under a glass dome, there was a vintage microscope in mint condition. In the past, this drugstore was not only a place to buy medicine but also a place where people would gather to chat about politics and every day life. Today, the pharmacy sells home made medicinal oils and elixirs and for Cubans, it’s a normal establishment. For me, it was a proper museum! I ventured on the streets of the old town for a couple of hours, hiding from the rain and observing the daily life. In Plaza Vieja children were playing football. Near Plaza del Armas two men and a guitar were singing Guantanamera. 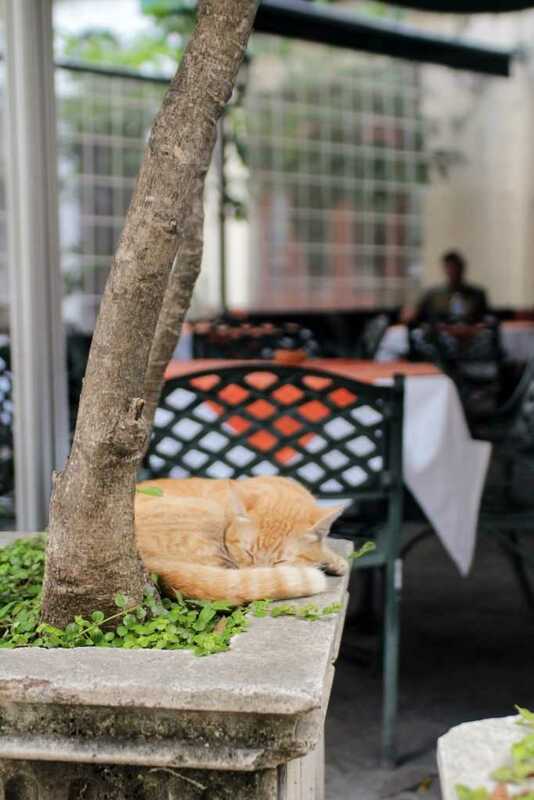 In front of a cafe, a cat was sleeping inside a flower pot. An industrial ship was just passing by, in front of The Royal Force Castle, while owners of classic cars were inviting tourists to get in for a ride around the city. Then I headed back towards the Capitolio (still under renovation) and then found my way down, to the Malecon. The wind was still powerful and the whole street was closed, as the waves were crashing over the wall. The water didn’t scare me so I crossed over to take some pictures of Hotel National. That was the landmark I wanted to walk to, before going back to the casa and check on my lost luggage. As soon as I reached Hotel National, the storm started. There was nowhere to hide and the rain was very powerful. I literally had to duck under a big leaf, at the bottom of the rocks on top of which the hotels’ garden is, rushing to get my camera inside my backpack and hoping that it is waterproof. When the rain stopped, there was nothing left dry on me, so I decided to head back. I took a 5 minutes break in Antonio Maceo park, as my feet were hurting, when a girl came to me asking for a light. I told her I don’t smoke and then she started to tell me about this festival that was going on just a few streets away, saying that I should definitely go. I recognized straight away that it was a scam, and I was right. As long as I stood on that bench, she approached several other people, probably with the same line. I continued to walk back towards the Old town when another young man approached me. This time, he invited me for a drink. Cuban men can be very persuasive and my feet were hurting, so I sat down with him, without ordering anything though. He actually seemed ok, but again, he invited me at another party, in the evening. He gave me his mobile number, his home number, his work number, even his mother’s number, making me promise that I will call. I found this to be very amusing. Back at the casa, the owner gave me an address and told me that I have to go there in the evening, to meet my guide and the group I will be traveling with for the next eight days. He also informed me that there were no news about my luggage, the airport was still unreachable. In the afternoon I met Eliner again, who had big plans for the rest of the day. It was actually very interesting how we could communicate, each of us understanding probably about half of what the other one was saying. We headed towards the Rum Museum and, from there, we crossed the street towards a factory like looking building. I was a bit suspicious but he told me trust him. We passed through a metal detector and, before you know it, we were on a strange looking boat, leaving Havana. The panorama of the capital left behind was very nice, but where were we going? In 2003, a group of men actually hijacked one of this small ferries and tried to take it to Florida. They run out of fuel about 60 miles from the American coast. But that was not the case, as the ferry I was on arrived safely after 15 minutes to the town of Regla, on the other side of the harbor. The town was very quiet, with small but colorful colonial houses. We headed up on the main street and then stopped in a bar, to get a beer for Eliner and a local coke for me. The moment I walked into that bar, everybody looked at me. They were not used to having tourists around. 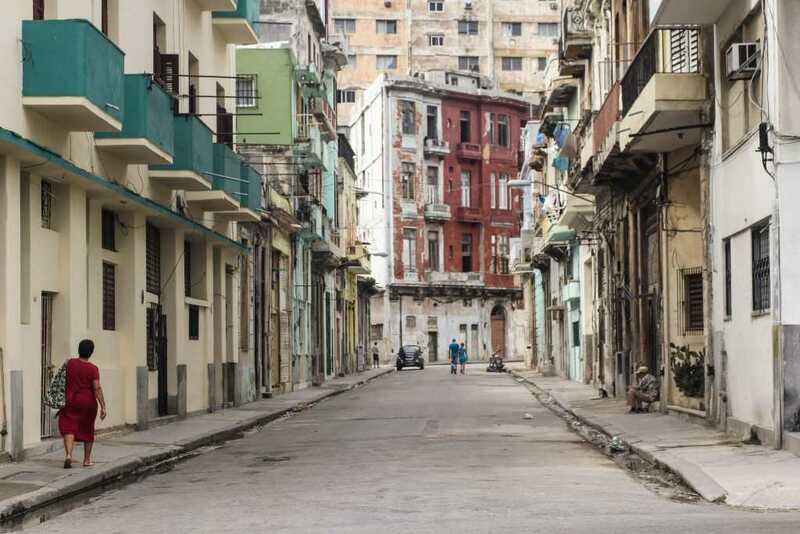 After the short pit stop, Eliner showed me the “slums” of Regla and told me about life in Cuba, and how people are forced to survive with almost nothing. The government gives everybody a ration card on which they can buy very cheap a limited number of essential products. They are entitled to less than 3 kilos of rice per month, about half a kilo of beans, 1 kilo of sugar, 1 liter of milk per day (but only for children under 7 years old), 12 eggs (but only from September to December). The ratio card also entitles them to 0,2 grams of beef or 0,4 grams of chicken every 15 days, per person. For everything else, they have to pay the same prices as tourists. An interesting fact is that if you own a cow for example, you are not allowed to kill it for food. You can go to jail for up to 15 years if you do this. 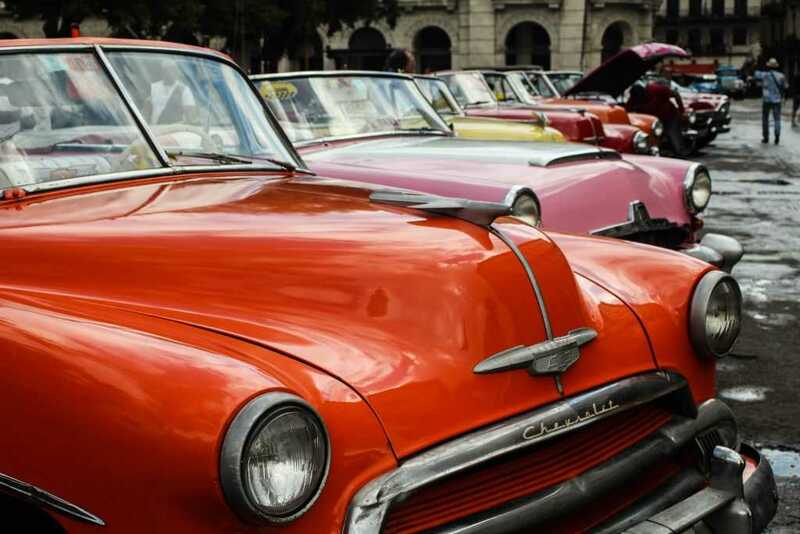 Cuba has a dual currency, the national peso and the convertible peso. Tourists use almost exclusively the convertible peso, which is the equivalent of 1$. One convertible peso equals 25 national pesos. A person that works for the state earns less than 20 convertible pesos a month. This is why, everybody that has an opportunity to work with tourists and gain an extra CUC (convertible peso), they will. And that is why there are so many people that try to do small scams in Havana, for one or two dollars. It’s the survival instinct. It is a sad reality and if in my country I know that it’s up to me to build my life as I wish, in Cuba no matter how hard you are working and no matter how ambitious you are, you don’t really have options for a better life. From Regla, we took the local bus to Guanabacoa, another village, where Eliner’s sister lived. We made our way down a muddy road, alongside houses half finished, and as the rain was getting stronger, we turned left and went through a green gate, inside someone’s yard. In front of the house there was an old rusty white Ford, that probably didn’t move for years. Eliners’ brother in law welcomed me with a large smile. He then showed me his own way of making an extra peso: he was an engineer so he built his own device for making sink pipes. He was so proud of it and even if it looked very rudimentary, it was doing the job. He told me not to tell anyone about his little business because if the government would find out, he can go to jail. But I think it is important for people to know how hard life is in Cuba and what sacrifices people have to do to be able to grow their children. And nobody could identify him from these lines anyway. After talking to him, we went inside the modest house, and met his wife too. She immediately put the kettle on to make some coffee. Their little one was at the table, drawing. Eliner was very proud of him, saying that he had talent and that he wanted to become an artist. The older boy was playing with a friend and his house. He had his arm in a cast because of a game of football. With all the struggles, they seemed to be a happy and united family. I would have loved to stay and spend more time with them but it was already late and I had to go back to Havana to meet the group. We said good bye and climbed the hill with the muddy street back to the main road. The bus was not coming so Eliner stopped a van. We jumped in front and other people went in the back. It was an actual communal taxi, a car that goes towards a certain area and picks up passengers on the way and stops at requests. As a Cuban, you pay the same amount as a tourist, but in the national peso, while a tourist will pay in convertible pesos, so 25 times more. But because I was with Eliner, they considered me a local. It was quite a long bumpy drive, but with an astonishing sunset above us. Once in Havana, we took another communal taxi in the form of a vintage Chevrolet and went to Vedado, where the restaurant was. We got there half an hour earlier, so we waited under the roof of a van-shop. Cubans are very friendly people and they will help you and welcome you always. It was time to say good bye to Eliner and promise that we will meet when I would return to Havana, after touring the country. I was the first one to arrive at the restaurant and neither me or the waitress knew which booking I belonged to. So she invited me to take a sit near the bar. The restaurant was on top of a building, at the 7th or 8th floor, and the panorama of the rainy city was very calming. I was definitely not wearing the proper outfit for the elegance of the place. My face was all red, my hair unwashed due to the lack of shampoo and I was wearing a dirty pair of jeans with a very red tank top. A total disaster. Soon, our guide arrived and the first thing I did was to tell him my lost luggage story and ask him fold help. The year before, when I was in India, there was a similar situation with one of the girls and the guide sorted it for her. Unfortunately, I was in Cuba and not in India, and the airport would simply not answer the phone for the whole time I was there. Slowly, slowly, the other members of the group started to arrive and we begun to chat and get to know each other. The first person that did an impression on me was Emma, the 18 years old adopted daughter of an American couple. She was adopted from Romania, the country where I am from. I couldn’t believe it and they couldn’t believe it either that a Romanian (me) was going to be in the group. What a big coincidence! The dinner was lovely, it was actually the first time I would eat proper food in Cuba. 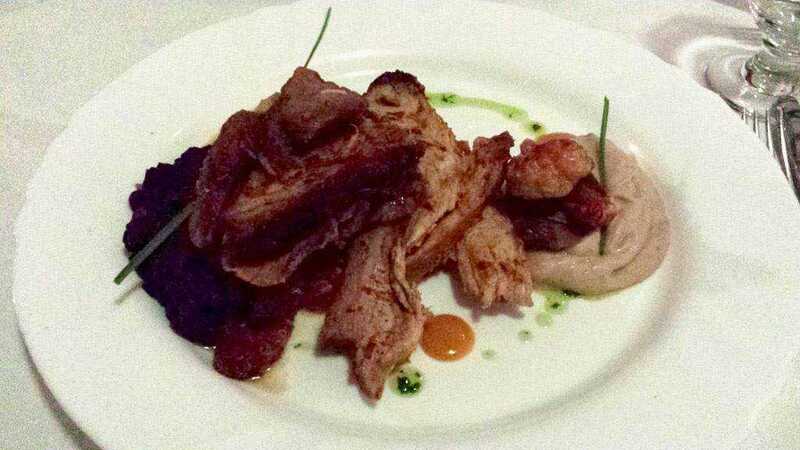 I had a pork dish with yucca puree. The flavors were very nice, especially the Yucca, which I was tasting for the first time, but the meat was overcooked. Cuba is not known for it’s cuisine and I’ll have to disappoint you but the food is pretty basic. Apparently things have moved upwards in the past years and there have been a lot of improvements food-wise, but still, I would not consider Cuba a foodie destination. Unfortunately, even if the flavors are nice, they are not extraordinary and the meat gets overcooked most of the times. On the way back to the casa we shared taxis. Iris, Emma’s mother, was so kind and when we reached their casa she brought me a bottle of shampoo and one of conditioner. You don’t get to appreciate the little things you have access to until you don’t have them anymore! It was really funny to get even his mom’s number. He was trying to make sure I will find him at some “home” when I call, haha. The capture of the cat is very unique. The reality is not always “happy”. I can only imagine what can sacrifices people to be able to grow their children. I bet you made amazing memories and a lot of beautiful photos! I was really lucky to catch that moment. I took several pictures of those cats and at some point, one of them turned around. And I snapped the picture. Sure the best way to travel is to befriend a local. And nice photos by the way! I wish I could go to the Carribean! ? Reading your story is very insightful, it puts into perspective how cultural difference varies drastically form country to country, to be jailed for 15 years for killing your pet cow…how no matter how hard you try in life, life in Cuba will more often than not remain the same, a vintage Chevrolet as your commute…There are so many places in this world that I’d love to explore, and reading blogposts like this can be very insightful! 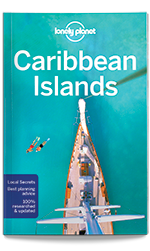 A real festival would excite me too, but I read in the Lonely Planet that is a very common scam. There is not festival, the girl was just trying to walk with me and tell me a sad story, to get some money from me. You took a communal taxi in the form of a vintage Chevrolet?? Seriously?? That’s definitely a great story to add to your wonderful adventure! Havana is a beautiful place!! I symphatize with Cubans who have to work so hard and still not have a good future, the same is true in the Philippines. But there is hope, I know tourism will continue to explode in Cuba and this is something they should really really develop. Gotta take care of tourists who brings in the money… oh, so… Joanna. Did you call the Cuban who was inviting you for drinks? No, I did not call that guy, haha. The problem with Cuba is that when the embargo will be lifted, the country’s tourism will explode. Even now the capacity is at limit. I am not sure how that would benefit Cuba. It’s a very delicate situation, imagine a country stuck in the ’60, being bombarded with all the new technology and ideologies. It’s madness. Thank you! I don’t look down at the scammers in Cuba because I know that behind their actions there is a strong reason and that is their way of surviving. And their scams will only cost a tourist a few dollars. It’s not like in Europe, where a taxi driver will try to rip you off of 100 euros. And I really do have a bit of compassion for them because I know that for most of them, that is their evening dinner. Cuba always intriges me. When I see those old Chevrolets and cars, I just love it. We used to have oldtimers too when I was a little girl. It was my dads hobby. Now we are driving boring new cars haha. But every country has it charme and Cuba is certainly unique in the world for the historical ambience. I don’t drive but I was fascinated by the way of driving a Chevy. Did you know that the clutch is actually a big handle on the right hand side of the steering wheel? So amazing that you actually owned one of these old cars in your family! What I see are great tourist spots. They remind of me of the Philippines. 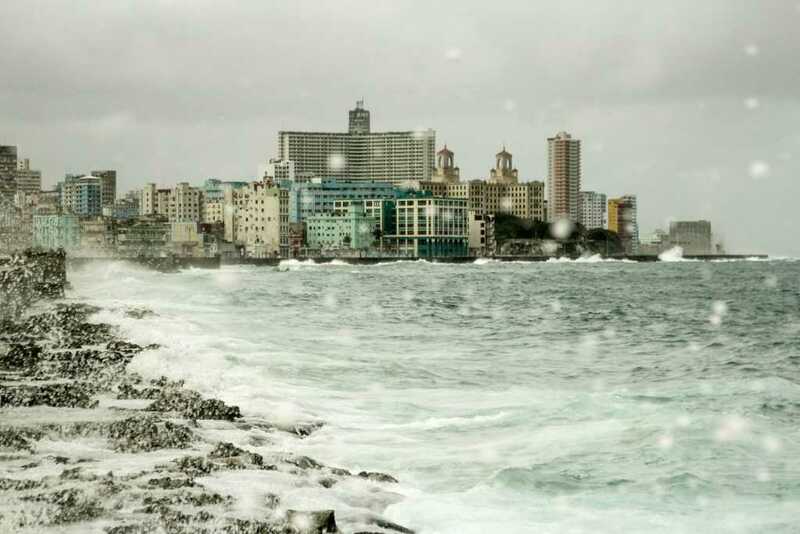 I grew up there and the way Havana looks remind of the Philippines. It’s so unfortunate that people have no way to better their lives. I know some people in the Philippines are in the same boat. The access for opportunities are sometimes not there. The place is beautiful but the people can’t have the opportunities they deserve. I love how you narrated your day. Looks like Cuba has still a lot of potentials to be a better country, huh? Good thing you spotted the scammer. I think it’s really pretty common in third world countries. i would love to visit Cuba someday, too. This post inspires me to add it on my list. First off.. Beautiful photos! Secondly.. Your writing style is just captivating! I love the way you tell your story, it makes me feel like I am there experiencing and visiting Cuba with u! With how you write and ability to share a story, you can quality to be an investigative journalist. You enlightened me about Cuba and its people. Their hospitality and affinity w/ tourists are like Filipinos. They sure have been thru tough times, but they are survivors, and happy people. 1) Johnson & Johnson Pharmacy – I agree with you that the drugstore looks more of a museum. I can’t believe it’s a place where they sell homemade medicinal oils and elixirs. 2) Malecon – You took a great shot of Hotel Natio. That was courageous of you to cross over. This makes me curious about Cuba and its people. I feel a bit sad of Cuban’s life. But I like their environment though, through your post. Looks calm. Especially the photo of the bay. Thanks for highlighting about the issue regarding scam but I believe people do that often especially to tourists around the area. You just have to be clever I guess. Reading this was so captivating and I can’t believe how different culture is there. A friend of mine visited Cuba a couple years ago but she never told me anything like this. Also the story about that guy who tried to pick you up is so funny yet a bit scary. Never imagined life in Cuba would be that hard. I understand that their government is giving out rations of food for the people in slums however, it’s just too unbearable. 3 Kilos of rice for a month? .2g of beef or .4g of chicken every 15 days? I don’t know how or what will I do to make all these fit me for a month. In a way, that’s the beauty and advocacy of a traveller. You get to see the beauty and learn the story of each place you go to. You paint a beautiful picture – I’d love to visit Cuba some day. Those cars look awesome. Your photos are amazing! They show a beautiful and stunning city! I wish more people could see Cuba. I think it would open their eyes up to the atrocities of the world. I hope you’d be able to get back your luggage soon! I’m glad too that your camera is still fine even when you got drenched. It’s good to read about your travels, I learned something new about another country. I do hope life gets better for the locals there. Your story about Havana sound full of adventure. Your story that being approached by the man who offered your his phone numbers, reminds me of almost similiar story that happened to me in Monte Carlo. Love your photos! They captures the details of Havana. Some lovely pictures and descriptions of your day. Such a variety of experiences in a short space of time. 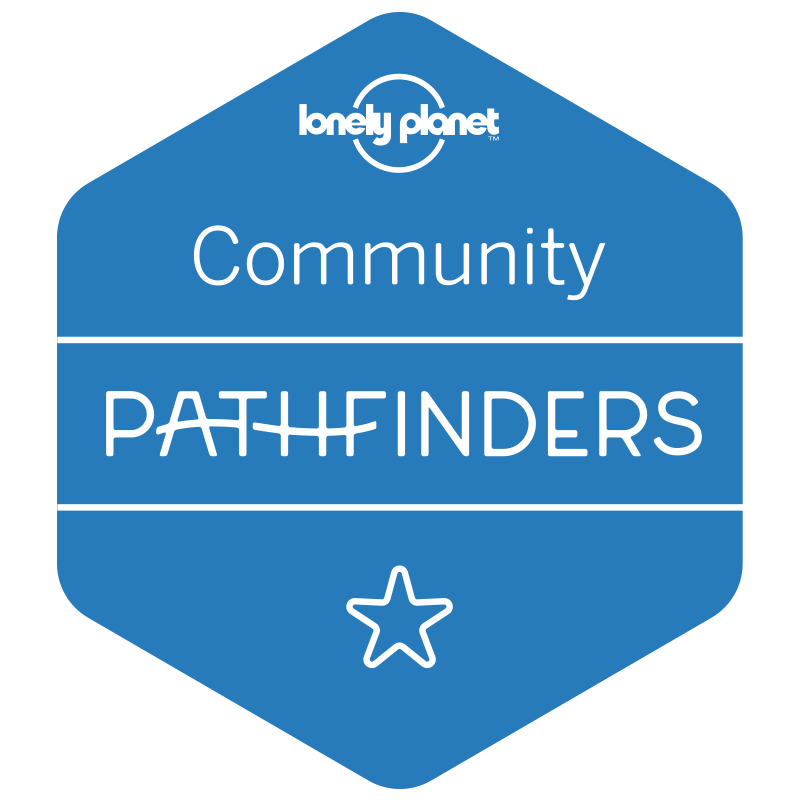 I like the way you interact so much with the community rather than just seeing it all as a sightseeing expedition. As you discovered, there’s so much more ‘reality’ to see. Your story is so amusing. You reminded me once again that I should visit Cuba as soon as possible. I really like the photo of the Chevrolets. I’ve never been to Havana and I loved your story and they way you describe things. Your photos are amazing! I always find posts about Cuba fascinating. It really is a country suspended in time. The streets look beautiful and the people seem friendly. I love it when locals approach me for conversation and to find out more about me. What is the food like in Cuba? I’ve always wondered. Cuba has been in my bucketlist for quite some time now and it’s just perfect timing i came across your lovely post. The photos are beautiful, reminds me alot about the old streets of Manila – charming, inviting, nostalgic. Hope i can have a share of a proper Cuban meal when i fly soon! 🙂 Heard about some exquisite dishes to try! A very interesting perspective on Havana from a local. I would love to get there before it is ruined by tourism. Do you think it has changed because of this? Travel with locals is the best options always. However i think Cuba will soon change after opening to USA and will lose the original charm. 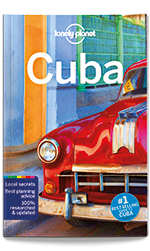 Very interesting how scams are popping up with the tourism boom in Cuba. Some people can’t miss out on an opportunity. I also loved the photo of the beach during the storm. Havana looks like such a fun and relaxing place to visit. Your images are amazing! I’ve always wanted to visit Cuba, and honestly I don’t know why didn’t try to back home in Haiti. Such a beautiful place and your picture captured it well. The young man who gave you all of his numbers including his mother’s number is hilarious. You’re such a badass traveling alone, I’m too chicken. So annoying that it was raining on your day of exploration but glad you pushed on and met a tour guide of sorts, ever call his mom? LOL The boat thing would’ve scared me but you have seen with new eyes because of it. It is sad how they live there, with nothing to strive for. I guess things might get a bit better for them now with embargoes lifting. 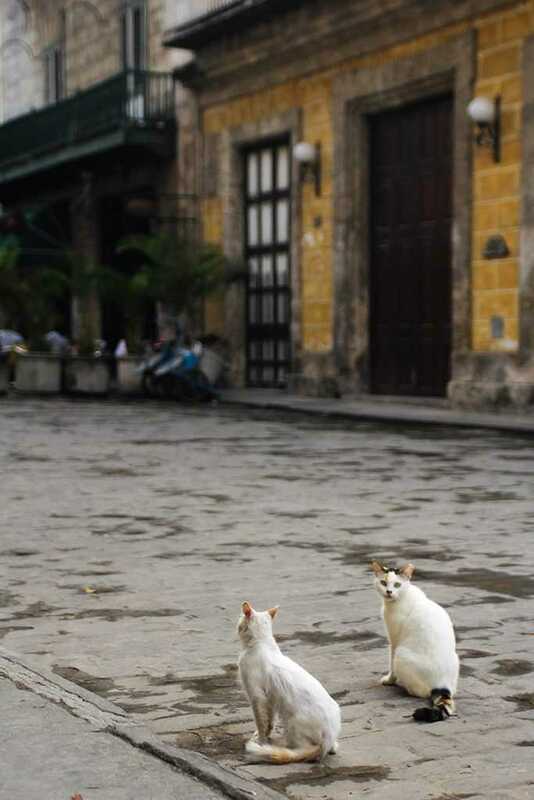 I love those cats on the street! The place looks absolutely amazing… I want to go on a trip! But can’t! …anyways thanks for sharing such wonderful places… I really enjoy your posts and pics! It’s so sad to hear those stories about how people could be jailed for killing their own cow or having a small side business. But good for you for finding out this information and reporting it. I would still want to visit Cuba for the experience and culture, even if the food isn’t too great. What an experience! While reading and seeing the photos, I could picture everything in my head. I have never been in Havana, though I would love to! I am glad that the rain didn’t ruin your plans. It is sad reading that no matter how hard people work there, they won’t get a better future. Realizations like that make us grateful for what we have in our lives. The food looks delicious as well. Thank you for sharing! The lasting feeling I got after reading your post is sadness. I feel for the Cubans who worked hard but get so little. I’m hoping for the continuous development of their country. PS. Although I got to smile on the part when a cuban gave you several phone numbers just so you’ll call him back. I really like the photo of the sleeping tabby cat in the planter box. It’s very cute and so typical cat! It is nice that you got to met up with your new-found Cuban friend, Eliner, again! Your story is very interesting and moving at the same time. The part where you talked about the ration cards and the amount of food the people are entitled to receive really broke my heart. I thought these things only happen in the movies. Great pictures though. Thanks for sharing your experience. I’m really impressed about your writing skills. While reading your post, every word went straight to my heart. I bet you enjoyed every bit of your journey there. Looking forward for more posts like this one! I get thrilled reading your post. You really are a good writer! Keep on writing about your travel diary. It’s very helpful! Your story made me appreciate my country and government fairly enough. It was a good read. Thanks for your warning on how to deal with very nice strangers. Haha. Poor guy. He must be really desperate. I love how you specifically described anything that you see. Like we were with you while you were there. I think that cuban guy likes you! 🙂 Did you actually go to the party with the young cuban guy? Lovely pictures, which camera did you use Joanna?I liked the picture with the cats. they lent a human element to your blog. I love all your posts about Cuba . But that one could easily become my favourite one ! The photos are so good ! Do you actually take these photos yourself ? If so , I think you are very talented ! The one with the cats is just perfect ! Nice post ! What an interesting account of your time in Havana. We only spent a day in Havana and I so wish we were there longer so we could have interacted with the locals longer like you did. Cuba has been getting a lot of buzz among travel bloggers. And I must say that your post is one of the most insightful about this country. I like the vintage chevrolet.I could imagine the lives of people there through your writing.